Move over, Southwest Airlines! Hawaiian Airlines is now delivering the best unit revenue results in the airline industry. In the first half of 2016, most U.S. airlines have reported significant unit revenue declines, continuing a trend that began a year earlier. Southwest Airlines (NYSE:LUV) and Hawaiian Holdings (NASDAQ:HA) have been the only major outliers. During the first few months of the year, Southwest Airlines modestly outperformed Hawaiian Holdings. But in the second quarter, Hawaiian took the lead -- and it is likely to extend its advantage as the year progresses. Hawaiian Airlines posted solid unit revenue growth in Q2. Image source: Wikimedia Commons user Hakilon. In January, both Hawaiian Airlines and Southwest Airlines projected that their revenue per available seat mile (RASM) would be roughly flat in the first quarter. However, only Southwest was able to completely stabilize its unit revenue during that quarter, posting a 0.1% year-over-year increase in RASM. Meanwhile, Hawaiian Airlines' RASM declined 1.2%, which was still far better than the industry average. The company blamed its RASM shortfall on weaker-than-expected cargo revenue. Early in Q2, it looked like the relative performance of Southwest Airlines and Hawaiian Airlines would be similar to what it was in Q1. Southwest predicted "modest" RASM growth for the quarter, while Hawaiian again projected that unit revenue would be roughly flat on a year-over-year basis. Instead, it now looks like Hawaiian Airlines posted the best unit revenue performance in the U.S. airline industry last quarter. On the one hand, Southwest Airlines clarified at its investor day in late June that it expects unit revenue growth of less than 1% for Q2. Management noted that the domestic fare environment remains very competitive. Southwest Airlines' unit revenue rose less than 1% last quarter. Image source: The Motley Fool. On the other hand, Hawaiian released a bullish investor update on Thursday afternoon. The company now expects to report a 1%-2% year-over-year RASM gain in Q2. It also expects its unit costs to come in near the bottom of its previous guidance range. Hawaiian's Q2 unit revenue growth is particularly impressive because Easter fell in March this year, moving holiday-related traffic into the first quarter. The strong result stems mainly from two factors. First, industry capacity growth on West Coast-Hawaii routes came to a halt last quarter, leading to an improved supply-demand balance in a region that generates about half of Hawaiian Airlines' revenue. Second, the Japanese yen has strengthened against the dollar, giving Hawaiian a respite after several years of currency-related RASM declines in the international market. 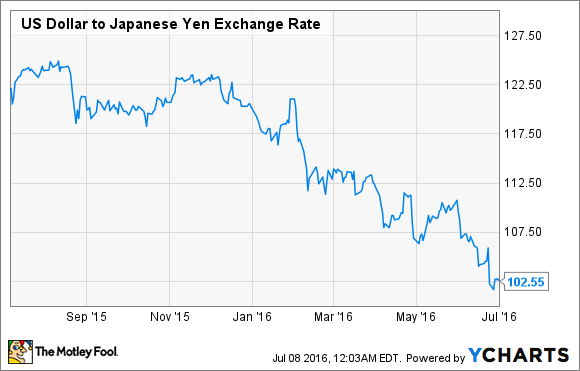 US Dollar to Japanese Yen Exchange Rate, data by YCharts. As of Thursday, analysts expected Hawaiian Holdings' earnings per share to reach $1.03 in Q2. Thanks to the company's better-than-expected revenue and cost performance, it should be able to beat that projection by at least 10%. Fortunately, the conditions that bolstered its unit revenue last quarter are likely to continue over the next year. West Coast-Hawaii industry capacity is still on track for very modest growth in the second half of 2016. Meanwhile, the yen rose dramatically during Q2, which will boost Hawaiian's unit revenue in Japan over the next year. Hawaiian Airlines will also start to reap the benefit of an aircraft retrofit campaign later this year and in early 2017. These retrofits will replace the recliner-style business class seats on its A330 fleet with full flat-bed seats that should generate much higher average fares, while also adding 28 more "Extra Comfort" seats with extra legroom. Cabin retrofits will boost Hawaiian Airlines' RASM starting later this year. Image source: Hawaiian Airlines. By contrast, Southwest Airlines has hinted that its unit revenue performance may deteriorate in the second half of the year. That's because it will start reporting smaller year-over-year growth in credit-card-related revenue after signing an enhanced deal with JPMorgan Chase in mid-2015. Thus, Hawaiian Holdings is poised to extend its unit revenue outperformance in the second half of 2016. This should lead to superior stock performance for investors.